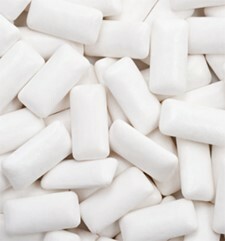 Eventually, scientist Thomas Adams succeeded in enhancing chicle with flavor, and his work would set off various trials to improve the ability to retain flavor – with peppermint found to be particularly effective. Mr. Adams helped bring attention to chewing gum by introducing it to vending machines and selling it in the subways of New York in 1888, but chewing gum really took off when a soap industrialist named William Wrigley Jr. promoted it as an add-on to his products. From “Juicy Fruit” to “Doublemint” gum, Wrigley created one of the most successful chewing gum companies that ever existed, and many of his products remain popular today. Chewing gum is often purchased on impulse, but putting a little thought into the type of gum you choose can make a big difference to your oral health. Read the labels closely to ensure you have selected a sugarless variety that won’t harm your teeth, and then narrow down the field based on additional preferences – from flavor to active ingredients and beyond. If you need help in choosing the right gum, or are unsure about the effectiveness of a particular brand you have chosen, simply call your dentist for guidance. Just like most things, chewing gum should be done in moderation chewing gum too frequently may lead to jaw muscle fatigue or more serious issues such as Temporomandibular Joint Disorders (TMD, TMJ).